I hope you all had a wonderful Halloween! I can’t believe it is already the 1st of November. And the weather sure has taken a turn here in Chicago. It is FREEZING! We went from hot to cold. Wahhh, I wish we had more Fall weather. I am a little biased though because I do get cold easily. But I’m sure you all can agree with me that 30 degrees is cold! When the weather is cold, I just want to be comfortable, cozy, and warm. So you know what I grab, a sweatshirt! I know I can’t be lounging around in my sweatshirt (which happens to be from the early 90’s and the color has faded while the decal is peeling off) all day and every day. But it’s hard not to, sweatshirts are so comfortable! However, I also know in order for me to feel motivated to get up and get things done, I need to look well put-together. So you want to know what my trick is? Going for the sweatshirt trend! Are you guys familiar with the sweatshirt trend? Basically it is a top made out of the same material and fabric as a sweatshirt. So it feels like you are wearing a sweatshirt but look more dressed up. This striped off the shoulder top I am wearing is a sweatshirt. Of course I had to test out this trend with an off the shoulder top. 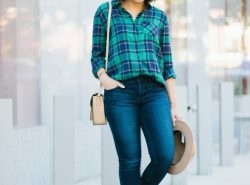 It’s my favorite kind of top and I love that I can wear it in the summer and fall! I love it! I feel cozy in it, and still look like I put in effort to look well put together. To be honest, all I did was throw this sweatshirt top, boyfriend jeans, and loafers together. So easy. Whoever came up with the sweatshirt trend is a genius! Have you guys tried it? If you haven’t, I highly recommend it. Plus, you can pull it off at work too! They look too chic to be a sweatshirt. Talk about the perfect work week attire! I love the sweatshirt trend so much, I want to get more! So below are the sweatshirt tops I am loving lately. The best part is they are affordable! The majority of my picks are under $60! Let me know what you think! And for those experiencing the colder temps, stay warm and hopefully these sweatshirts will keep you cozy! This top is so pretty, love this look. How fun is this outfit? So adorable and kind of retro. LOVE it! I’ve totally been wanting to try this! I love the idea of cozying up in a sweatshirt but still looking cute! It is the best thing ever!! If you ever try it, let me know what you think! Such a cute sweatshirt! Love the stripes! 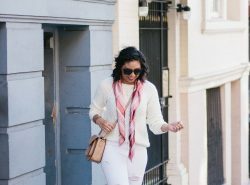 I’m all about comfort so this trend is absolutely perfect for me! In fact I recently got a sweatshirt too and it’s hard not to want to wear it every day! 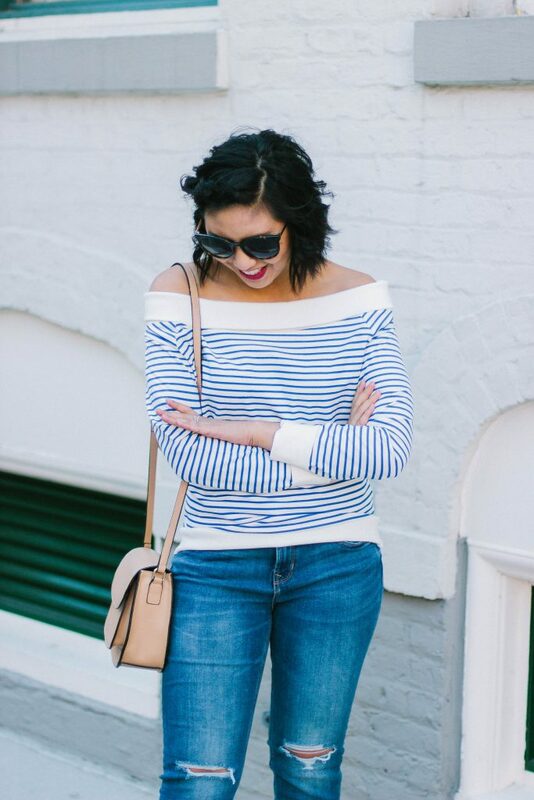 I adore this off-the-shoulder top you’re wearing here! It’s a great summer-fall transition sweater! Me too girl! I bet! Thanks Deborah! The sweatshirt trend is totally the best trend ever! I love your striped sweatshirt. this sweater is so fun! 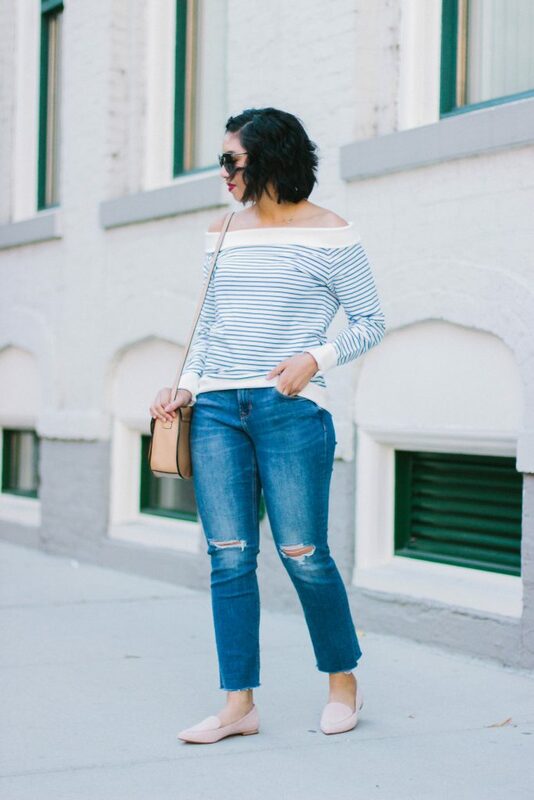 love that is off the shoulder! It seriously is! Like SO cute, yet SO comfy! I’d say clever and cozy! I mean you cannot go wrong with a fun sweatshirt! For real! Whenever you can mix cozy and cute together, it is a total win for me! This is definitely a trend I can get on board with! Because oh my gosh sweatshirts are so comfortable! Right! Seriously a genius trend! This sweatshirt is so cute! I RARELY see one with off-the-shoulder details! I love your flats too, the color is so cute! 🙂 This look is definitely a good Fall staple! I know, when I saw the OTS one, I knew I had to get it! Thanks Chloe! Awesome outfit babe, love those jeans! Love this sweatshirt, you look so pretty! The ultimate comfort! Love the outfit. I LOVE the OTS sweater trend so much. It’s the perfect blend of casual + chic. Sencillamente preciosa, el suéter es precioso. Time sure flies! Thanks Cris! Sweatshirts rule! haha My last one was from Zara with a slogan on about Karma, in mustard – just love it! Sweatshirts are the best! Yours sounds so cute! I absolutely love this outfit; that sweater tho, gorgeous! 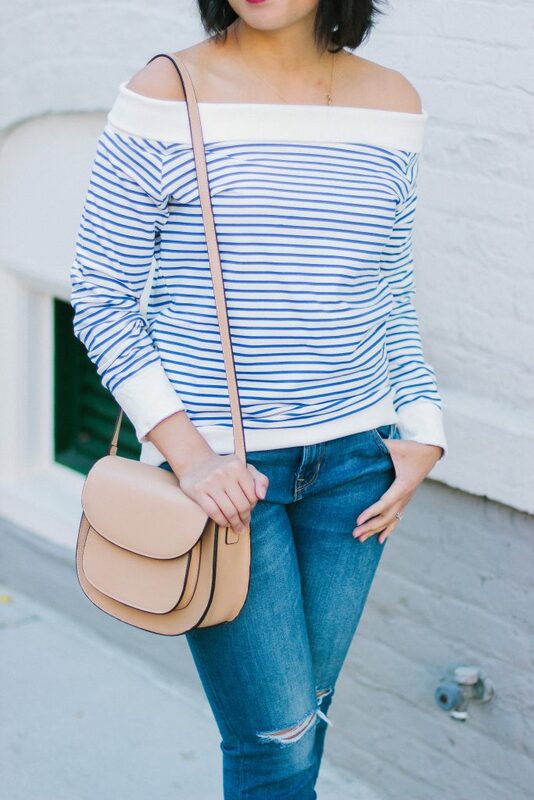 Love the striped sweatshirt and I love how you styled it! Love the sweater, Rach! You look so cozy! Sending hugs! I’m not sure how I feel about anything that is supposed to keep you warm intentionally exposing skin, but I do think this off the shoulder sweatshirt looks adorable on you. 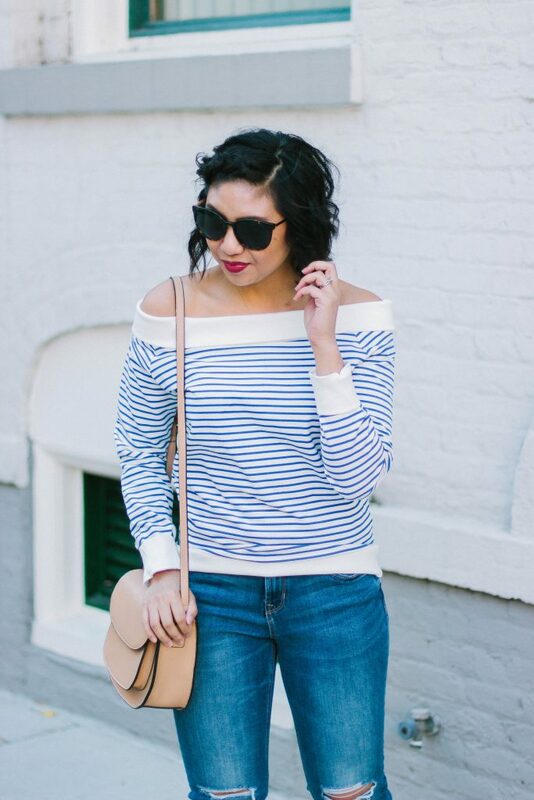 I’m just a sucker for Off the shoulder. So if there is a way to wear it during cooler months, I’m all for it haha! Thanks girl! Absolutely adore this look on you Rach! I need to get myself one of these adorable tops! Love this casual outfit!! I’m all about stylish sweatshirts and there are definitely a lot of options this season! These pink shoes are so pretty!! Thank you Valerie! Right? Sweatshirts are so comfy! I always love sweatshirt too. Such a great cool low-key outfit – love those flats! I loved this! Beautiful pictures and such a well written text! Thanks so much for sharing and keep up the great work. Thanks Saida! That sure sounds comfy! You have an amazing blog with stunning & trendsetting styles. We have recently launched Vogueista – a one-of-a-kind, sophisticated beauty & fashion website. Vogueista brings together a global community of glamour, beauty & fashion lovers to post their personal styles in beauty, fashion & fashion accessories. We offer a plethora of unique features for our community to get inspired by edgy styles, follow fashionistas like you, create style catalogs, & much more. We invite you to showcase your styles on vogueista.com and expand your style network. Come join our community. Be a Vogueista! Thanks for the introduction! I’ll check it out!